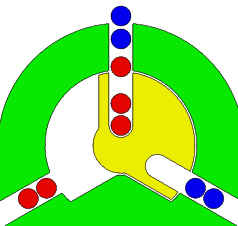 This JAVA applet is a software implementation of the Jukebox, a mechanical puzzle by Oskar van Deventer, see photo below. The object is to insert coloured coins in the correct order into the juke-box (at the top) such that they drop out into the right baskets at the bottom. All red coins should drop into the left red basket and all blue coins should drop into the right blue basket. 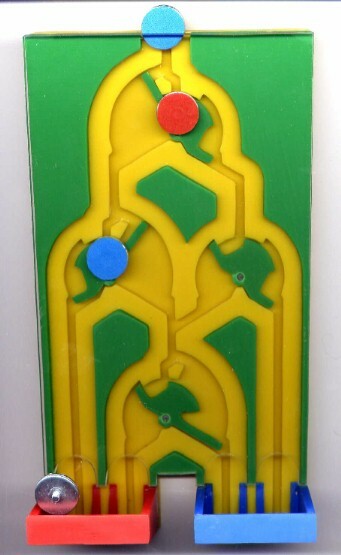 The switches flip the coins left and right. Can you drop the coins into the correct coin baskets and keep the music playing? Drop the coins into the basket of matching colour. You have an unlimited supply of coins. Key-press the left (red coin) and right (blue coin) arrow keys. You get a point for every coin dropped correctly. You lose one point for a wrong coin. You win if you score 40 or more. You lose if you insert 40 or more wrong coins.